Sections of the press and SNP politicians were soon up in arms that a former adviser to Margaret Thatcher allegedly tarred with the Poll Tax brush should be given such a post. The SNP described his appointment and the peerage as “scandalous”. They also accused Mr Cameron of “resorting to House of Lords ennoblement to govern Scotland”. A spokesman for the Scottish Conservatives said it “wholeheartedly welcomed” Mr Dunlop being appointed as Mr Mundell’s deputy. The spokesman added: “He played a pivotal role during the independence referendum campaign, winning plaudits across the political spectrum. “In the last few years, he has developed good relations with Scotland’s key business and civic figures, helping to secure significant achievements such as the City Deal in Glasgow. It was just another step in the remarkable career of Lord Dunlop, who was born and grew up in the burgh. 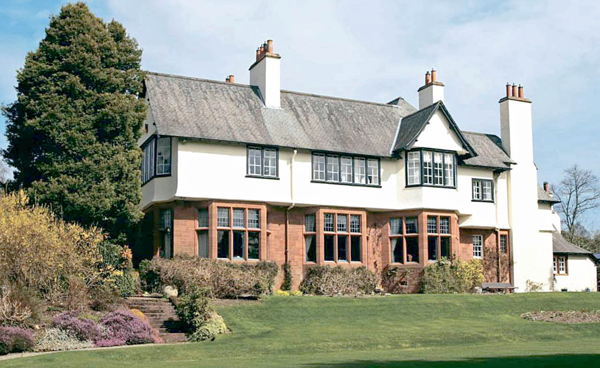 The home of his parents, Robbie and Shirley Dunlop, was the elegant William Leiper-designed mansion Lynton in Upper Colquhoun Street (pictured below). There the couple, who have since retired to Appin, brought up their four children, Alasdair, Timothy, Gillian and Andrew. Andrew, who was born in 1959, went to school at Larchfield School, which is now part of Lomond School, and Glasgow Academy. He studied at Edinburgh University from 1977-81 and gained an MA in Political Science and Government. Later he went to the University of London’s King’s College where he gained a postgraduate diploma in European Competition Law. From 1981 he had a year as a graduate trainee with the Midland Bank International in London and Bristol, then returned to Edinburgh for two years as Head of Research for the Scottish Conservative Party. This led to two years as Head of the Political Unit in the Conservative Research Department in London, then from 1986-88 he was a Special Adviser the Minister of Defence, George Younger. 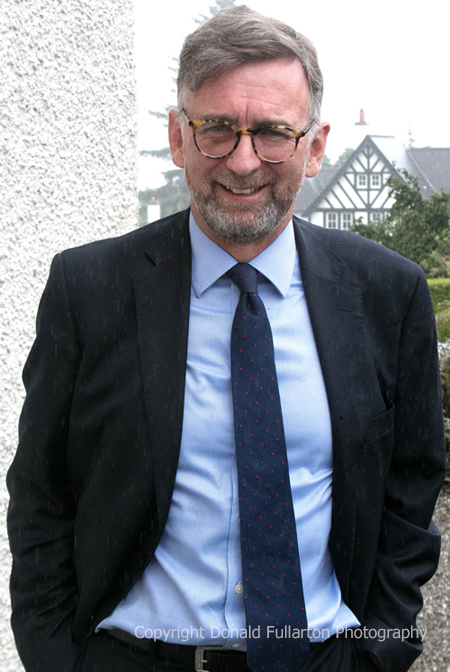 Next he spent another two years as a Special Adviser in Prime Minister Margaret Thatcher’s Office, in the Downing Street Policy Unit, covering a range of policy areas in the economic and social fields including taxation and Scotland. He was a trustee of the Atlantic Bridge educational charity think tank set up by Liam Fox MP, another supporter of Mrs Thatcher, to promote UK-American relations. However the Charity Commission removed the charitable status of Atlantic Bridge in 2011 after it came to light that the organisation was a political pressure group promoting a right wing agenda. In 1991 he founded and became managing director of Politics International Ltd., a post he held for nearly 17 years until Politics International became a subsidiary of Hasgrove PLC in 2008, and Andrew moved on. The company provides public affairs advisory services to the public and private or voluntary sectors. It offers community relations services, including public consultation and liaison, stakeholder dialogue, and consensus building; political research and information services; and political training services, including government relations, and campaigning and lobbying. It works in the areas of financial services, transport, consumer and retail, environment, defence, energy and health. For the next four years Andrew worked for Interel Consulting UK, one of London’s leading public affairs companies, as managing director and then as executive chairman. Interel has many blue chip companies, professional organisations and international businesses among their clients. Andrew returned to No.10 in February 2012 as Special Adviser on Scotland to Prime Minister David Cameron, a post he held until May 2015 and which included having a key role in obtaining a No vote in the Scottish Independence Referendum in September 2014. He also served from 2011 as a Conservative Councillor on Horsham District Council, the area where he and his upholsterer wife Lucia and their three daughters live in the village of Jolesfield Partridge Green, but stepped down because of pressure of business in 2013. His main outside interest is swimming, and he is a former chairman of the Atlantis Swimming Club and current chairman of the Sussex Seahawks Swim Team. He is a member of the management board of the Amateur Swimming Association’s South East Region. Andrew’s brother, Dr Tim Dunlop, lives in Shandon and is a former governor of Lomond School.